Indeed, ZipRecruiter, University Job Posting, Glassdoor, etc. AdviceOne LLC is a growing wealth management firm that offers financial planning and asset management for a broad client base. This is a fast-paced firm that thrives on constant change. We have lofty goals within our industry and have added 10 employees in the past year who have helped us grow, but we need more quality team members to continue our growth and fuel our quest for expansion. If you join our firm and show dedication and hard work, your growth is limited by only you. You will have the opportunity to utilize and enhance your skills in an environment where hard work is recognized and rewarded. What Else Does AdviceOne Have to Offer? Currently we are not offering internships. NO PHONE CALLS PLEASE! Securities offered through Securities Service Network, LLC. Member FINRA/SIPC. 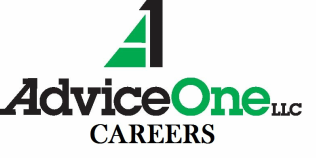 Advisory Services offered through AdviceOne Advisory Services LLC, Registered Investment Advisor.